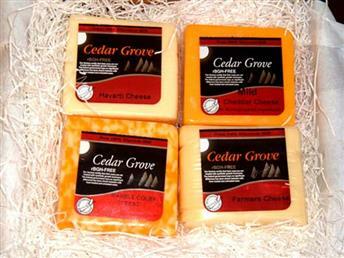 Cedar Grove Cheese makes cheese the old-fashioned way in a state-of-the-art facility located in the rich farm and dairy country of southwestern Wisconsin. Producing a variety of traditional and specialty cheeses, Cedar Grove Cheese maintains a strong commitment to the environment and quality cheese production. In 1993, it was the first cheese producer in the country to pledge that its products were rBGH-free. Milk free of the rBGH synthetic hormone is purchased from over 20 Wisconsin farms. Each day over 100,000 pounds of milk are converted into 10,000 pounds of cheese. Licensed cheesemakers oversee production ensuring the use of natural ingredients. Biologically innovative techniques have been developed to clean up cheese production wash water so that clean and pure water is returned to local streams and rivers. Located in Plain, Wisconsin, Cedar Grove Cheese offers tours and classes to educate the public about the fascinating art of cheesemaking.